The Tuba City 30’ x 60’ quadrangle encompasses approximately 5,018 km2 (1,920 mi2) within Coconino County, northern Arizona. It is characterized by nearly flat lying to gently dipping sequences of Paleozoic and Mesozoic strata that overly tilted Precambrian strata or metasedimentary and igneous rocks that are exposed at the bottom of Grand Canyon. The Paleozoic rock sequences from Cambrian to Permian age are exposed in the walls of Grand Canyon, Marble Canyon, and Little Colorado River Gorge. Mesozoic sedimentary rocks are exposed in the eastern half of the quadrangle where resistant sandstone units form cliffs, escarpments, mesas, and local plateaus. A few Miocene volcanic dikes intrude Mesozoic rocks southwest, northwest, and northeast of Tuba City, and Pleistocene volcanic rocks representing the northernmost extent of the San Francisco Volcanic Field are present at the south-central edge of the quadrangle. Quaternary deposits mantle much of the Mesozoic rocks in the eastern half of the quadrangle and are sparsely scattered in the western half. Principal folds are the north-south-trending, east-dipping Echo Cliffs Monocline and the East Kaibab Monocline. The East Kaibab Monocline elevates the Kaibab, Walhalla, and Coconino Plateaus and parts of Grand Canyon. Grand Canyon erosion has exposed the Butte Fault beneath the east Kaibab Monocline, providing a window into the structural complexity of monoclines in this part of the Colorado Plateau. Rocks of Permian and Triassic age form the surface bedrock of Marble Plateau and House Rock Valley between the East Kaibab and Echo Cliffs Monoclines. The Echo Cliffs Monocline forms a structural boundary between the Marble Plateau to the west and the Kaibito and Moenkopi Plateaus to the east. Jurassic rocks of the Kaibito and Moenkopi Plateaus are largely mantled by extensive eolian sand deposits. A small part of the northeast-dipping Red Lake Monocline is present in the northeast corner of the quadrangle. A broad and gentle elongated anticline, the Limestone Ridge Anticline, forms the crest of Marble Plateau. Here, Paleozoic and Mesozoic strata generally dip less than 1° to 2° in all directions from a central high area along Limestone Ridge north of Bodaway Mesa and east of Cedar Ridge and The Gap. The Limestone Ridge Anticline plunges gently southeast toward the Painted Desert at the south edge of the quadrangle and northward toward Lees Ferry, Arizona, at the north-central edge of the quadrangle. The Tuba City Syncline is a very broad northwest-southeast-oriented-synclinal downwarp that parallels the Echo Cliffs Monocline north of Tuba City. The Preston Mesa Anticline is a small fold present on Kaibito Plateau north of Tuba City. 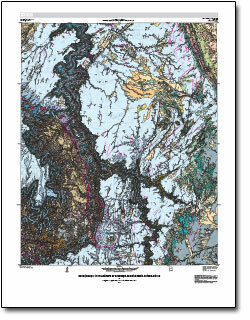 Billingsley, G.H., Stoffer, P.W., and Priest, S.S., 2012, Geologic map of the Tuba City 30’ x 60’ quadrangle, Coconino County, northern Arizona: U.S. Geological Survey Scientific Investigations Map 3227, pamphlet 31 p., 3 sheets, scale 1:50,000, https://pubs.usgs.gov/sim/3227/.